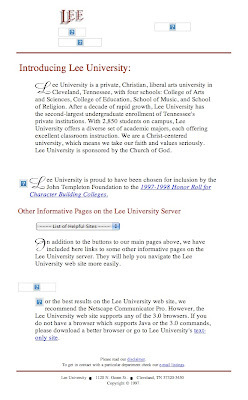 Over one decade ago in 1997, Lee's site was little more than a one column page with a few links and an explanation of the 2,850 student university. Browse the original site here. 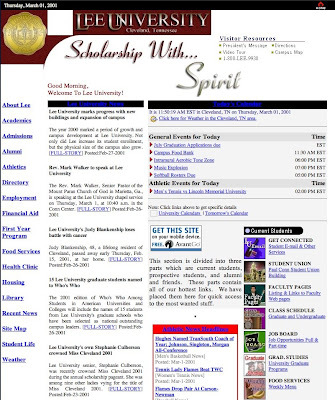 By the time 2001 rolled around, Lee's site began shaping into something that looked like a real Web site, complete with news, calendar items and more frequently updated items. Also, a series of colorful icons represented each section for current students, while a navigation list ran down the left side of the page. 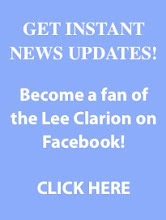 Browse the old site here. 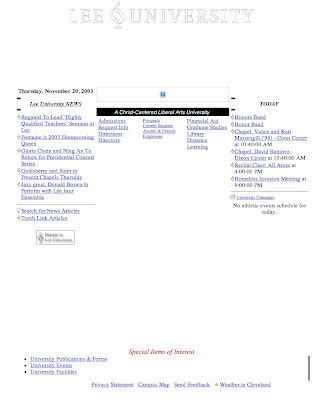 When 2003 came, Lee's IS&T department decided to clean up the site, replacing the previous confusing jumble of links and icons with three simple columns of lists: news, links, and calendar. Browse the old site here. This is the site as it currently appears in 2008. 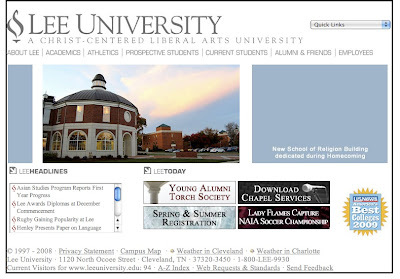 The site keeps the motif of a simple white background while featuring student photography, latest news, and timely links. See the current site here. 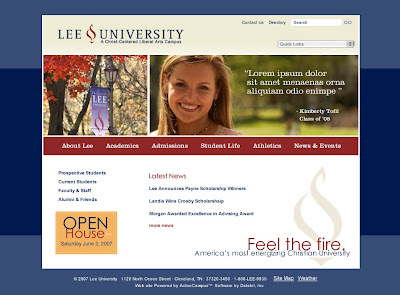 And finally, an example of LeeUniversity.edu as it will appear soon in 2009. For the first time the clean white background has been tossed away and replaced with striped shades of blue. More photography is featured, doing away with colored squares. In addition, the school logo has shrunk with the Flame placed properly in the center. Lastly, the navigation bar has moved below the central images. See more images from the coming site here.